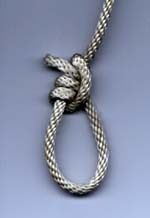 This knot builds a loop that will easily get bigger - by sliding the knot up the rope toward the free end. But, when pressure is applied to the loop, it will not get smaller. Its most common use in Troop 595 is on the ropes that attach a tent to tent stakes in the ground. The loose end is attached to the tent. The loop goes around the stake and the knot slides by hand to tighten or loosen the rope. But the knot will not slide by itself.